Relaunch of the renovated Todmorden Market. People are being asked to put Calderdale markets on the national map by voting in the competition for Britain’s Favourite Market. NABMA (the National Association of British Market Authorities) is urging people to cast their votes at: https://www.nabma.com/vote/ and type in the name before November 30. 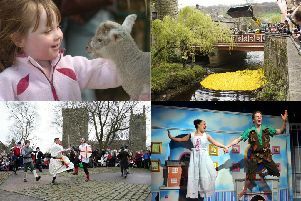 Coun Barry Collins, Calderdale Council’s Cabinet Member for Regeneration and Economic Strategy, said: “Our distinctive local markets have so much to offer, it will be hard to choose a favourite! The competition comes at an exciting time for markets in Calderdale. The Council is investing in markets to help them play an even bigger part in the economy and people’s lives. Following the ground-breaking transformation of The Piece Hall into a world-class heritage destination, improvements to the much-loved Victorian Halifax Borough Market are a major next step in the Council-led development of the town centre. This includes restoration of unique heritage features and ambitious proposals for pop-up stalls, Sunday trading, later opening hours and evening entertainment to attract regular and new visitors. A council spokesman added: “The shopping and trading experience at Todmorden Market Hall has improved after the building benefited from a £500,000 refurbishment, and Hebden Bridge Market is thriving in its new home at Lees Yard on the edge of St George’s Square, with better facilities and a popular new Saturday artisan market.